Plasmolifting Incubator Mini B 100 is a thermostat used to incubate platelet-rich plasma (PRP) samples created using the Plasmolifting method to produce Plasmolifting gel, an autologous substance that can be used in the same manner as a dermal filler. Plasmolifting gel is autologously derived and thus has minimal risk of causing allergic reactions. Plasmolifting Incubator Mini B 100 is a dry bath incubator used exclusively to convert PRP into Plasmolifting gel. You can order Plasmolifting PRP Gel online from MedicaDepot.com or by calling our friendly customer service associates. When you buy wholesale Plasmolifting Incubator Mini B 100 from Medica Depot, you can rapidly convert autologously obtained PRP to a viscous gel that can be used to volumize aging skin. The Plasmolifting Incubator Mini B 100 is a dry block incubator with a capacity of 24 x 0.5ml tubes. A product insert is also supplied. This heat block provides precise and uniform heating to PRP samples in order to denature the proteins contained within the sample, altering the solution to a viscous, gel-like suspension that can be used as a dermal filler. The Plasmolifting Incubator Mini B 100 is small and compact, taking up little space. It features a liquid crystal display (LCD), time, and temperature settings. As well, it provides notifications when a fault is detected or instances of overheating. The heat block that houses the samples are interchangeable, and a variety of blocks made to house tubes of different sizes are available. PRP is a material derived from the patients’ own blood that is re-administered to encourage healing in damaged or aged tissue. This medical instrument facilitates a second step in the Plasmolifting process to convert harvested PRP to Plasmolifting gel. 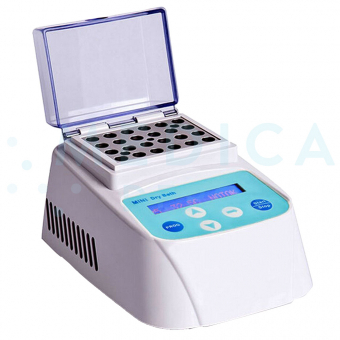 This incubator provides thermal heating to PRP samples, denaturing plasma protein to create a milky white viscous gel. This substance can be used in the same manner as a dermal filler, injected to soften wrinkles, lift and fill sagging areas and restore facial contours by volumizing and lifting dermal tissue. Blood collection – 9ml is collected from the patient through venipuncture. The blood is collected into special Plasmolifting vacutainer tubes. Centrifugation – The tubes with the blood samples are centrifuged to separate the various blood components into individual fractions. Extraction of the PRP layer – The portion of the volume consisting of platelet-rich plasma is removed and transferred into a syringe. Heating phase: Preheat the incubator to 95°C for 8 minutes before sample processing. Cooling stage: Allow the sample to cool on the heat block (two minutes). The sample is now ready for administration. Plasmolifting Gel is used to fill wrinkles and add volume to sagging cheeks. The effects of this treatment are long-lasting, but not permanent. Patients should return for repeat treatments to prolong the effects. Plasmogel can be used on most facial areas, for instance, to lift the midface and cheeks, to tighten facial contours and to soften wrinkles and folds like the nasolabial folds. Plasmogel remains in skin tissue for up to three months, but the collagen-stimulation and tissue-regeneration properties of the gel contribute to effects that last up to 18 months in most patients. PRP treatment helps patients with aging or damaged skin to rejuvenate and remodel their skin for a more youthful or aesthetically pleasing appearance. Plasmolifting gel can be used on its own to correct wrinkles, redefine facial contours, and restore facial volume loss, or in combination with another aesthetic procedure to enhance the results and aid in recovery. The Plasmolifting protocol and instruments are an all-in-one simple process designed to produce PRP at low cost without sacrificing efficiency or safety. As the procedure is minimally invasive and the material used in treatment is derived from the body of the treated patient, complications and adverse reactions are very rare in PRP therapy. Patients may experience mild and transient reactions to the injection, including redness, swelling, and tenderness, which should resolve on their own within days after treatment.